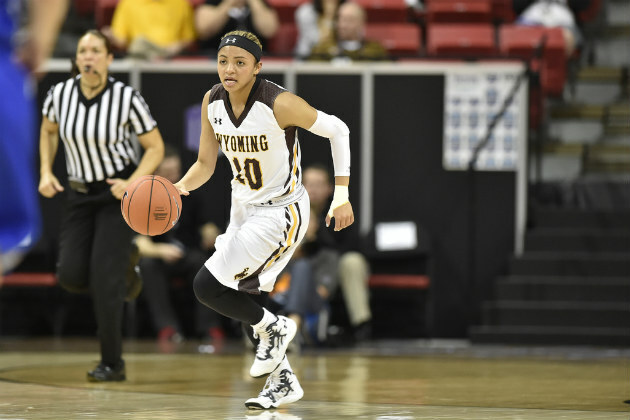 Two Cowgirl basketball players were recognized this week for their performance this season. Senior Marquelle Dent and freshman Marta Gomez were both announced the All-Conference team. Marquelle Dent was named to the All-Mountain West first team. Dent was also named to the All-Defensive Team as well. Marta Gomez was named to the All-Freshman team. Marquelle Dent leaves the Cowgirls as one of the most successful Cowgirls in history. Dent led the team in points, assists, steals, minutes played, field goals, and attempts this past season. Dent notched double figures in 14 of 18 games. She’s ranked in the top 15 in sever categories and is the only player to record over 1000 points, 500 assists, and 175 steals. Marta Gomez has a bright future with the Cowgirls. She is a first year player from Valles, Spain who started in 18 conference games as a freshman. She averaged 10.3 points per game and 5.1 rebounds. She was tops on the team in three point field goals made and attempts. She scored double digits in ten games. The Cowgirls were eliminated from the Mountain West tournament on Monday, dropping a contest to San Diego State.